Georg Philipp Telemann , organist and composer, was born on March 14, 1681 in Magdeburg, Germany and died June 25, 1767 in Hamburg, Germany. Today, Johann Sebastian Bach (1685-1750) and George Frederick Handel (1685-1759) are probably the most famous composers of the Baroque Period (1600-1750) in music; however, Telemann was born before, and outlived, both Bach and Handel, was more famous during his lifetime than either and, most remarkably, wrote more music than Bach and Handel combined! One of the main differences between Baroque style and that of the Classical Period (1750-1825) which followed, was the use of counterpoint - literally note (point) against (counter) note (point). With 21st century ears, we tend to hear a single melody, usually the highest part, with (harmonic) accompaniment; however, much of Telemann’s music consists of several melodies, all of which are equally important. Telemann is considered to be a link between late Baroque and the Classical Period. By the age 10, he had taught himself to play the violin, flute, zither and keyboard. At the start of the 18th century, music was only available to nobility or through the church - public concerts or even music stores didn’t exist. Telemann was a true innovator in making music available to the general public; in Leipzip in 1702, he formed a student society called Collegium musicum, one of the first series of concerts that was actually open to the public - J. S. Bach took over as conductor in 1723, resulting in Bach’s developing the keyboard concerto, specifically for the summer concerts held in Zimmermann’s garden on Windmühlstrasse in Leipzig. Telemann did his own advertising and started a subscription service for his works, most of which he even engraved himself. His works for flute include 11 Concertos, 3 Double Concertos (for 2 flutes or flute and recorder), 12 Fantasias for unaccompanied flute, numerous Sonatas and the famous Suite in A Minor for flute and strings. 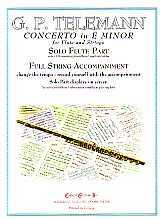 FLUTE CONCERTO in E MINOR is one of 11 Flute concertos which he composed. This concerto is interesting in that, unlike the usual 3 movements of later Baroque Italian Solo Concertos, there are 5 movements (although the 5 bar 4th movement is really just a transition or introduction to the 5th movement). Even more interesting is that the Flute does not play in the 3rd movement. The smp files combine the 4th & 5th movements as one file and include extra 3rd movement and Complete versions (file names start with “X”) which have Flute replacing 1st Violin in the 3rd Movement (an exercise in double tonguing and circular breathing! ).